Bearwallow Mountain is just 19 miles from downtown Asheville, on the way to Chimney Rock and Lake Lure (near Gerton). 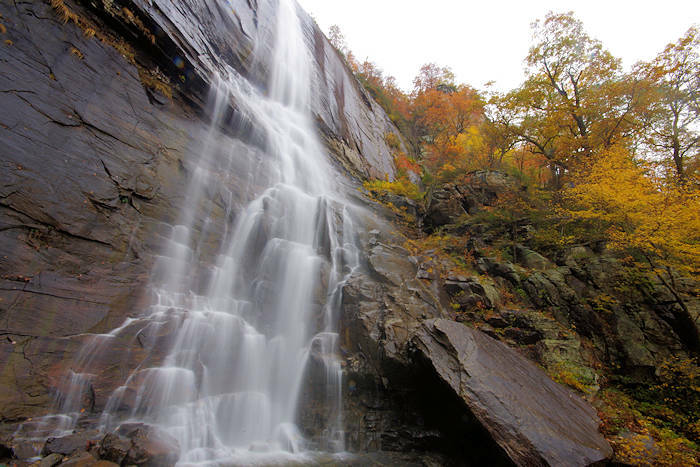 It's also just 16 miles from downtown Hendersonville and 10 miles from Chimney Rock and the Hickory Nut Gorge. 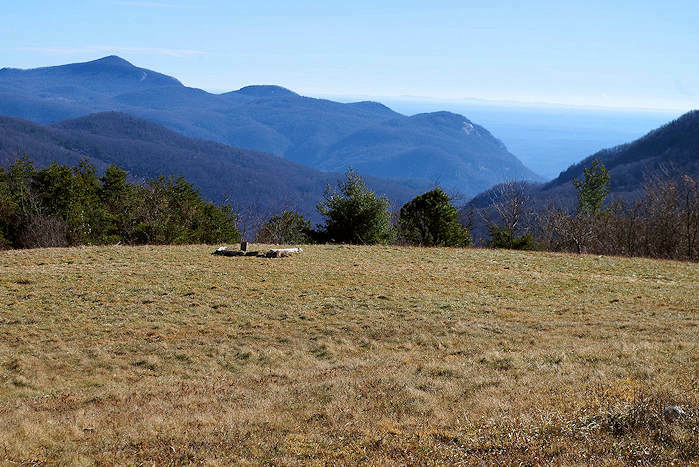 Thanks to the Conserving Carolina, a one-mile trail constructed by volunteers welcomes hikers to this bald summit at 4,232 ft. elevation with panoramic views. The 2.5-mile Trombatore Trail starts across the road from the trailhead (so you could combine both for a 7-mile round-trip hike). Located on the western rim of the Hickory Nut Gorge, the woodland hike ends at a grassy meadow at the top, home to friendly, grazing cows during the summer. The historic fire lookout tower marks the summit (not open for climbing), along with an ugly but necessary collection of communication towers. See sweeping views northeast to Mt. Mitchell and west to Hendersonville. After driving a mostly unpaved road up the mountain for two miles, park roadside at the top of the ridge. You'll see a gate in front of the service road that goes to the top. Walk around the gate and look for the big sign that marks the Bearwallow Mountain Trail. This trail climbs 537 ft. in elevation, so it's strenuous but not difficult. We recommend climbing the mountain on the trail (mostly shaded) and walking back down the service road for a two-mile loop hike. 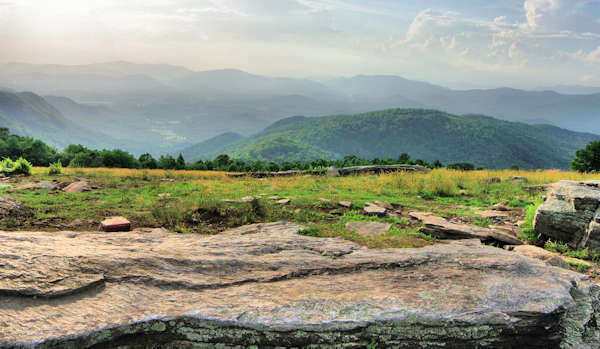 Find this big stone bench with the best view on the summit - perfect for sunset picnics. Despite being named for bears wallowing in the meadows below, bear sightings are rare. Camping and events (like weddings) are not allowed on the mountain since the property is still privately owned and protected by a conservation easement. Pets must be kept on a leash since there are grazing cattle. The North Carolina Forest Service fire tower was used until the mid-1990s to watch out for forest fires. Unfortunately, hikers are not allowed to climb the tower. 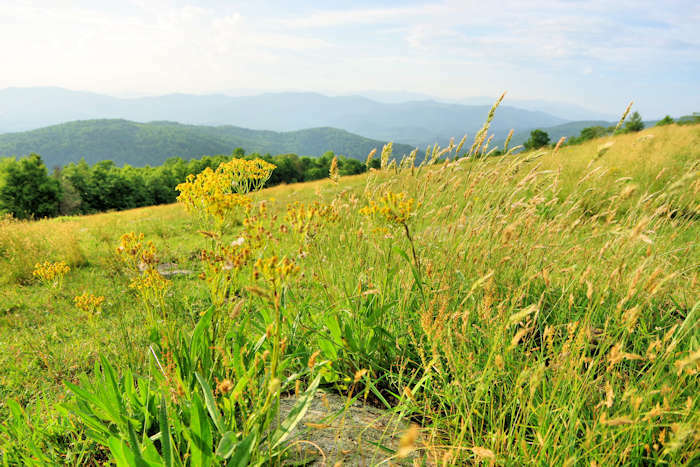 In 2009, Conserving Carolina secured of 81 acres on the mountain for protection and is working to secure 500 additional acres. 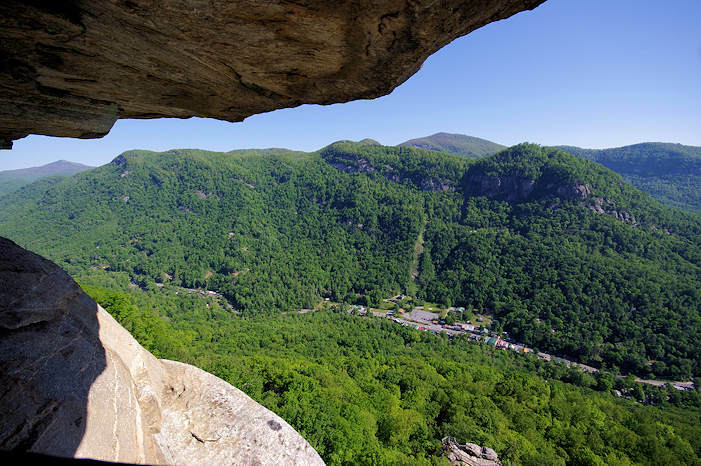 Then the trail will connect to their Florence Preserve in Hickory Nut Gorge and Chimney Rock State Park. 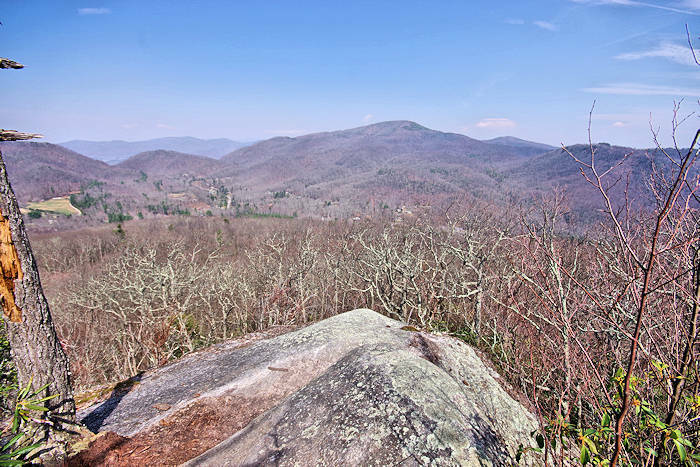 Read more about Conserving Carolina (formerly Carolina Mountain Land Conservancy). 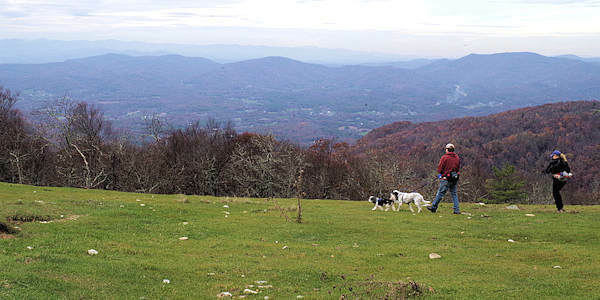 This is a great winter hike, a quick trip from Asheville. From Downtown Asheville: Take I-240 east and continue straight onto US Hwy 74-A East toward Chimney Rock. Follow 74-A East for about 12.5 miles (up a very long set of switchback curves) to the town of Gerton. Turn right on Bearwallow Mountain Road and go 2.1 miles to the top of the ridge and park on the side of the road (where pavement starts) near the gate in front of a dirt road (don't block gate). This road is unpaved, but all cars should make it fine. There are a few steeper and bumpier sections. This road continues down the mountain on the other side and eventually takes you to US 64 near Hendersonville. Nearby: Now you can hike to adjoining Wildcat Rock and Little Bearwallow Mountain, with a trailhead on US 74-A. Read more.